and as experienced by children in diverse contexts around the world. 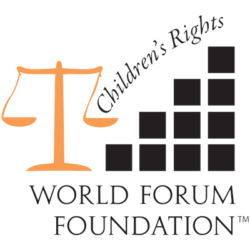 Child Rights will be a major focus of the 2019 World Forum on Early Care and Education. Not only will the latest version of the Child Rights video be shown, but there will be major explorations on Child Rights in sessions on refugees, stateless children, unregistered children, gender issues, indigenous peoples, children with special needs, children impacted by poverty and malnutrition, and children denied access to play. The mission of the Working Group on Children’s Rights (WGCR) is to promote the rights of the child through study, reflection, and dissemination of information about the multiple perspectives and contexts for children’s rights. What would it look like to document children sharing their views, ideas, and experiences regarding their rights? Could we create a more inclusive and complex conception of human rights through listening to and observing young children in diverse contexts around the globe? 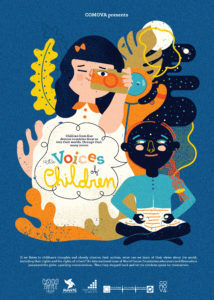 Voices of Children is a short documentary film created by an international team of educators and filmmakers in response to these challenges. The film is available to families, educators, advocates, and policy-makers as a provocation to reflect, dialogue and take action. This article introduces the Images of Rights Project, provides context and background and invites readers’ participation. It is the first of three Exchange magazine articles by the World Forum Foundation’s Working Group on Children’s Rights, which together explain the core principles of provision, protection and participation in the United Nations Convention on the Rights of the Child (UNCRC), explore a range of children’s rights issues, and invite you to join our Images of Rights project. 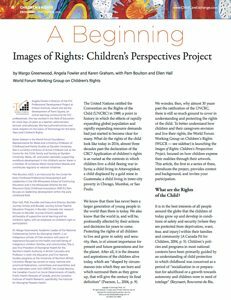 This article discusses the history of children’s rights and the development of the United Nations Convention on the Rights of the Child (UNCRC), highlighting the ways in which several countries have interpreted this document. It is the second of three Exchange magazine articles by the World Forum Foundation’s Working Group on Children’s Rights, which together explain the core principles of provision, protection and participation in the United Nations Convention on the Rights of the Child (UNCRC), explore a range of children’s rights issues, and invite you to join our Images of Rights project. Do Children have rights? How can they be active participants in the classroom? And what does this have to do with the United Nations Convention on the Rights of the Child? Ellen Hall, Alison Maher and Pam Boulton, of the Working Group on Children’s Rights discuss these questions and more in this article from Exchange magazine, May/June 2012. Using examples from a Reggio-inspired school with children from ages 6 weeks to 6 years, the authors emphasize the importance of children’s rights and our responsibility as adults to hear their voices. Seen and Heard summarizes research and theory pertaining to young children’s rights in the United States, and offers strategies educators can use to ensure the inclusion of children’s perspectives in everyday decisions.